A few months back, I wrote a blog post for World Car-Free Day in which I highlighted a 1986 NFB film about public transit called Mobility. 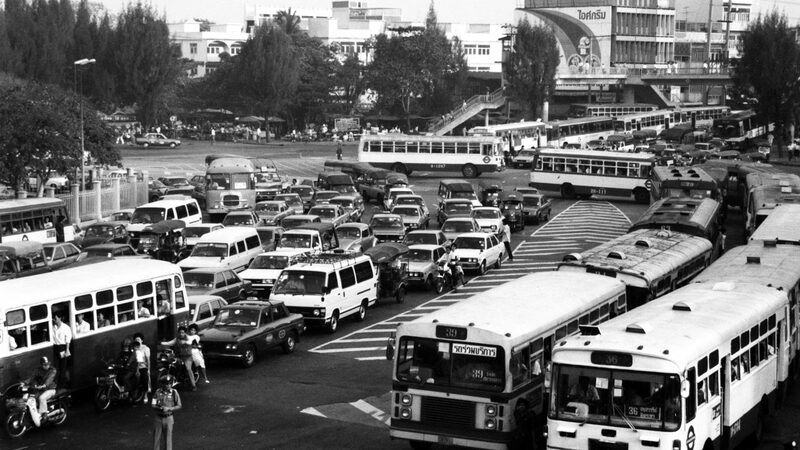 That film outlined innovative solutions to public–transit problems in the developing world. Since we published that post, we’ve added two amazing documentaries that deal with several unique public–transit programs in Canada. These films have been very popular on NFB.ca, so I thought it would be a good idea to discuss them both in a bit more detail. Regina Telebus is a 1973 documentary produced as part of the Challenge for Change* program. In it we are presented a pilot project put together by Regina Public Transit (funded by the federal government) where residents of a new area of the city can “dial-a-bus” and get service at their front door. Midway between a taxi and a bus service, this program was created to better serve the residents of a low-density area of Regina, who simply called Telebus and gave their address and the time they wanted to be picked up. The bus drivers were in constant contact with the dispatchers and adjusted their routes to pick up the passengers. If you’re thinking that this sounds a lot like modern ride-sharing services, you are correct. It’s refreshing to see that this type of service was possible over 40 years ago, even without modern technological tools like smart phones. The film was shown on television in Regina and elsewhere in Canada to great interest. In Regina, it was broadcast on CKCK (the local CTV affiliate) and was followed by a very successful open phone–line call–in program. At the time of filming, 12 North American cities were involved in similar pilot projects. 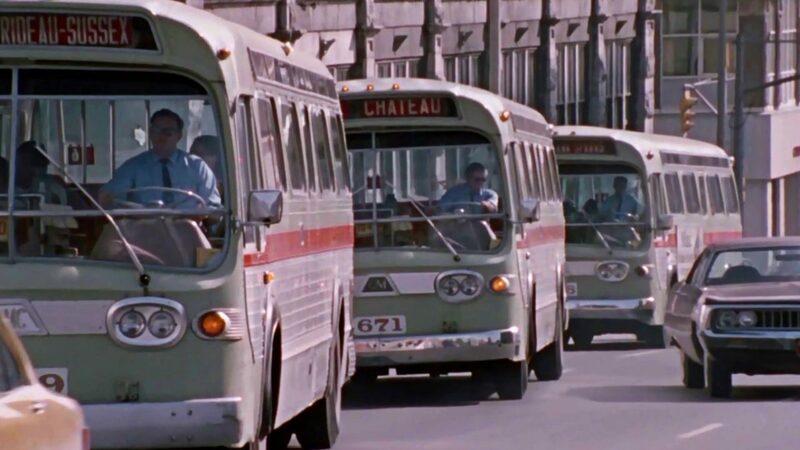 In A Bus for Us (1972), we learn that the residents of the Beacon Hill district of Ottawa are without any public–transit services of any kind. To get to their places of work, they have to rely entirely on their personal automobiles. As it made no sense to have so many people on the roads caught up in traffic and having to look for parking once downtown, the citizens approached local authorities to see if Ottawa public transit could be extended to their area. After two years of fruitless negotiations and frustration, they came up with a better idea: start their own bus service. The residents of this fast-growing area on the outskirts of the city realized that if their own bus service were to work, everyone would have to buy into the idea. They approached a bus operator and set up the Beacon Hill Express. This service, which started with one bus, grew to nine buses providing 13 trips each way every day, thus eliminating 700 car trips a week. The buses made several stops in the community before heading on the Queensway toward downtown Ottawa. Service was offered during the morning and afternoon rush hours. A Bus for Us was also the result of the Challenge for Change program, and it offers a perfect example of a community taking matters into their own hands to solve a problem. The film played on CBC Ottawa in 1973 and was very popular on television across the country. 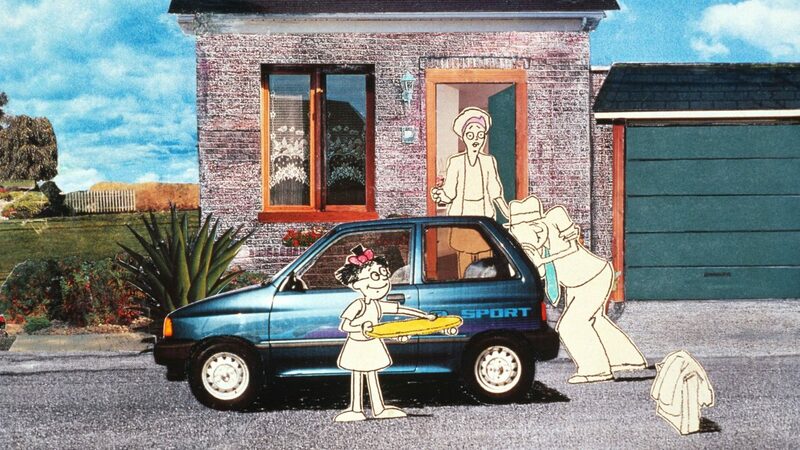 Due to its similar subject matter and short runtime, it often played with Regina Telebus on community cable stations. Both these productions show communities coming up with solutions to common transit problems. What really strikes me when viewing these films is just how fully invested the communities were in making these projects a success. Without that buy–in, you know these projects would have failed. *With funding from eight different departments of the Canadian federal government, Challenge for Change was a program that used film and video as a tool for social change. The program ran from 1967 until 1980. More information can be found here. This week, we focused on the theme of transportation. Watch 5 films on the subject, and catch up on everything else you missed with our weekly roundup. With the centre block closing for 10 years for renovations, we've found 3 films that offer a tour of Parliament, along with the rest of Ottawa.